A wave of foreign real estate buying is coming into Nicaragua (pop. 5.7 million, GDP/cap US$939). Due to the effects of civil war, natural calamities and probably bad luck, it is still one of the poorest countries in Latin America. The real estate market boom of Costa Rica has spilled over to its northern neighbour. By moving 45 minutes across the border to Nicaragua, buyers get pristine beaches at 1/5 the cost, similar (and in many cases better) infrastructure, relative political stability and a low crime rate, and a more diverse landscape and more authentic Old-World culture and architecture. The beaches north and south of San Juan del Sur and the colonial city of Granada currently enjoy the bulk of foreign attention. But attention is shifting further north and east. To the Northwest, near the historic colonial city and university center of Leon and the commercial center of Chinandega (see map) the beaches are great and prices very substantially lower. The coffee-rich and perfect year-round spring climates of the Northern highlands or Northern-Central regions of Matagalpa and Jinotega provide compelling alternatives to Panama's Boquete. To the East, interest is growing in the clear, blue and turquoise waters of the Corn Islands and other parts of the country's English-speaking Atlantic Coast. "Nicaragua has become the region's best value, as Panama and Costa Rica turn into "Florida" and "California", both withdraw tax benefits and become more expensive and restrictive on visa and residence policy," says Peronet Despeignes, a partner with Serenity Real Estate, an international agency that serves Northern Nicaragua and The Corn Islands. "The Costa Rica market is completely saturated," agrees Jaime Wheelock of the realtor Nicaragua is Hot. "Nicaragua is only 45 miles from Costa Rica. The price difference is 1,000%. You can buy the same lot here for US$300,000 that you can buy in Costa Rica for US$3 million. "The Nicaraguan market is still very new, while Costa Rica has been in business for the last 20 years. Nevertheless, those who came early were lucky. In the last 10 years there has been an 800% increase in prices of foreign-oriented property in Nicaragua. In the past 5 years the increase has been 4-500%. The core of the 'new boom' is San Juan del Sur, a small surfer's town across the border from Costa Rica which is now full of property speculators. It has a series of ten beaches and has attracted many developments, such as Morgan's Rock Hacienda and Ecolodge. "The buyers are mostly investors," says Barry Oliver of Century 21, San Juan del Sur. "Plus there are a lot of higher-end executive-type surfers." Opened in February 2005, the Century 21 office has grown from a partner and a secretary to 20 agents. Nearby are the beaches of the province of Tola, where seven developers are putting in around $500 million each. And further up the coast is Montelimar, host to big developments such as Barcelo Montelimar. "There is a boom in the Tola region, and that's where the highest return on investment (ROI) is," says Wheelock. "You pay around US$150-200 per sq. mt. for beach front property, and then US$60-80 for Ocean View. A golf course 200 m from the beach will be US$75 sq. mt." Granada, the third largest city, lies on the banks of Lake Nicaragua, Central America's largest freshwater lake (also known as Lake Cocibolca, it contains freshwater sharks). The city is commonly called the "Gran Sultana del Gran Lago" - the Great Sultan of the Great Lake. Foreigners are drawn by its colonial charm. Those who have settled have built hotels, and opened cafes, bars, and restaurants. In Granada, more than 50% of the Spanish Colonial houses have been bought and restored by Americans now living full or part-time in Granada. The Colonial market is inflated and little is left available at reasonable prices. However, tourists, retirees, vacation home buyers, and investors continue to flock to Granada. In Granada, prices of US$300,000-500,000, or US$100-200 per finished square foot, are not unheard of for beautiful turnkey Spanish colonials. Anything you might find below that price range is likely to be smaller than average and require substantial renovation. Leon offers good-sized Spanish colonials requiring little or no renovation from about US$100,000-200,000 -- or $50-100 per square foot. Units requiring renovation are available for significantly less than US$100,000. Renovation costs -- depending on your preferences, and absent a major root canal -- run from US$20,000-50,000. Large land parcels within five-10 minutes of the Leon city center are available for less than $1 an acre. The 'local' property market has also been doing well recently. Industry is growing fast in the textile-producing free zones around Managua, the capital of Nicaragua, because of the recently signed Central American Free Trade Agreement (DR-CAFTA), which is already having a major impact on Nicaragua. Managua is experiencing a rise in prices, especially in its most exclusive neighbourhood, Santo Domingo, dubbed the city's Beverly Hills. Leon and Granada battled over political dominance of the country through the 19th century, as sister colonial cities. Leon was the first capital of Nicaragua, and competed with Granada for the title until the country settled on the compromise of Managua. Leon is located 90 minutes north of Managua on an excellent road, and it now competes with Granada for tourism. It enjoys a reputation as the nation's university center and safest city, but it hasn't enjoyed the same level of interest and restoration as Granada. Leon's closest beaches, Poneloya and Las Penitas, are not the beaches of San Juan del Sur - they're not as developed, active or topographically appealing, but provide a more practical alternative given their proximity to city services and amenities. The Leon region offers a unique quality: property for just about every lifestyle, all in close proximity. For those interested in a Granada-like experience, it offers more Spanish colonials and historical Spanish churches. It also offers a bustling university town atmosphere for those who want more of the city life (Leon has the densest concentration of universities in the country, including the second oldest university in Central America); suburbs in the inner periphery of the city, such as Santa Maria and Fatima; abundant farmland to the west, east and north on excellent roads; and good beaches 15-20 minutes from the town center in Poneloya and Las Penitas. The road from Leon to both beaches is atrocious and overdue for a repaving. We're told this is expected to be completed by 2008, which should bolster land values. Leon still offers beachfront for as low as US$7 a square foot or small bungalows for US$30,000. A US$225,000 100-acre ranch is for sale just five minutes driving distance from the beach, offering the perfect mix of topography, access and privacy for a high-end oceanside development. For those interested in the cooler climes of mountain life, there's Matagalpa. Boquete-like, it's just 90 minutes north of Managua. Jinotega is about 30 minutes from Matagalpa. Both are coffee country, surrounded, Boquete-like, by majestic mountains (though a couple suffer from severe deforestation). Work is now underway to repave the entire approach from the commuter town of Sebaco, through Matagalpa to Jinotega - making the area more accessible than it's been in years. Particularly intriguing is the 5 kilometer stretch of largely undeveloped land along the high-elevation mountain highway from Matagalpa's town center to Jinotega. Land along it can run as low as US$14,000 per acre. It is sparsely occupied, mostly by a some small homes and a scattering of ecotourism-oriented hotels, including the famous, German-themed Selva Negra resort. Nearby Jinotega offers properties with exceptional 360-degree mountain views, such as US$45,000 three acre lots. "For investors looking to get at least one step ahead of the herd and the 'path of progress', Northern Nicaragua is definitely the place to be," says Despeignes of Serenity Real Estate. The Corn Islands, located just off the Atlantic Coast in the Southern Atlantic Autonomous Region and about 2 hours by plane from Managua, offer the most beautiful beachfront in the country: Caribbean-style white sand and clear, blue and turquoise waters. It's another world, more like Jamaica than Nicaragua. English is more widely spoken than Spanish. Property values are extraordinary compared to the price of this kind of beachfront in other Caribbean islands like the Bahamas and Jamaica, including virgin, tranquil beachfront just off a main road or path still available for as little as US$75,000 an acre. But tranquility doesn't mean inaccessibility. The Islands are less than a 2-hour daily flight from the International Airport in Nicaragua's capital of Managua. It's an easier trip here than it is to many other Nicaraguan beaches. Along with firming plans for deepwater port in nearby Monkey Point and a new trans-Nicaraguan paved road from the Pacific to the Atlantic, there are reports and rumors of plans to build a new international airport in the nearby provincial capital of Bluefields and to retrofit the Big Corn Island airport and runway for international flights from Miami and Costa Rica. The best one can hope to get for a prime beachfront lot with a house on it these days, elsewhere in the Caribbean, is $1,300 to $1,500 per square meter in places like Jamaica, Aruba and the Dominican Republic. But Serenity Real Estate's Despeignes points out that the Corn Islands offer tranquil, but accessible beachfront for less than $29 per square meter -- not far from the center of town or the island airport. Nicaragua is not only Central America's best value -- it's the Caribbean's," said Despeignes of Serenity. "But buyer beware: There are serious property conflicts on the island, requiring extra due diligence." As of December 2007, Nicaragua has effectively ended the rolling blackouts that stifled development for much of the past 2 years. Credit is given to 3 power plants coming on the grid in November. The government projects to have a surplus of power by mid 2008. To encourage foreign investments, the government passed Law 306 that gives a 10-year tax exemption from income and real estate taxes. There are about 6,000 American expatriates and retirees living in Nicaragua, and the number is rising. Can import one vehicle for personal or general use duty- and tariff-free, and sell it after five years, exempt from consumer sales tax. Can import an additional automobile every five years under the same duty exemptions. Most purchases are cash transactions with the buyer and seller directly negotiating. And beware - determining who exactly the owner of a property is can be difficult. Generally, properties that changed ownership during the communist Sandinista regime in the 1980s should be avoided. The Sandinista nationalized several land areas and converted them to cooperatives during their rule that ended in 1990. 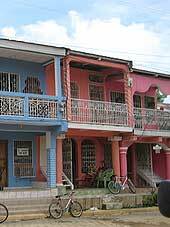 Nicaraguan house prices, rents, and letting income - real data! How expensive are houses in Nicaragua, compared to the rest of Latin America? How much rent can be earned from Nicaraguan property, compared to the rest of Latin America?